Maple F30 / OM / OOO size? Thread: Maple F30 / OM / OOO size? I’m starting to think about what I might wat to look for in the coming year. Did Guild ever make a maple backed F30 size guitar that would be worth looking for? I don’t care for the sound of anything much smaller, and really can’t play anything too much larger, but it all depends. I tried searching the interweb and saw reference to a GSR F30 maple, but my guess is that would be a little pricey. Can't recall a maple-bodied version other than what you mention, but there's a wealth of opportunities in the 16" jumbo (F40 outline) size. F40's, GF30's, F47M's to start, also F65ce (not to be confused with JF65) which was a top of the line but only 3-/12" deep, might be a good bet for comfort. Even had 2 different scale lengths, were 24-3/4 with 1-11/16 nut until late '94 then transitioned to 25-5/8 with 1-5/8 nut. Hmmm all Maple that small , would it be kind of Brite ? OP's only looking for maple-backed F30 or similar/close size. 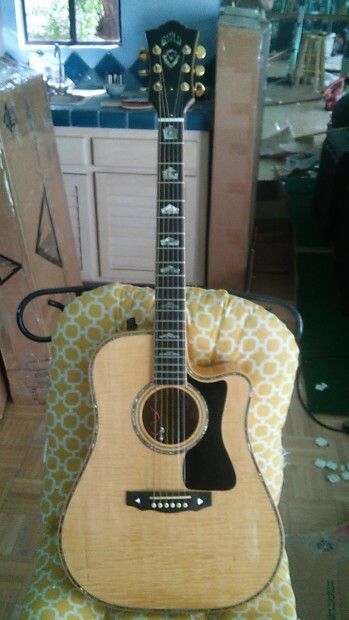 Only know of 2 Guild flattop models ever to fit the "all maple" description, one was the F65ce which did have a maple topped version; the other was the D130ce (dreadnought); both of which have reputations for being acoustically underwhelming. Maple isn't an ideal top-wood but probably resists feedback tendencies. Its use then becomes understandable because they were primarily intended for plugged-in performance use. Last edited by adorshki; 02-08-2019 at 08:20 PM. Ray what'd you do to the site? All of a sudden reverted to a different format when I submitted my last post....interesting...comes up the way I'm used to in Chrome....hmmm....had to log out, gave me an "all cookies cleared" message and came back up "normally" ("Let's Talk Guild" banner across top of page). Last edited by adorshki; 02-08-2019 at 08:25 PM. Did Guild ever make a maple backed F30 size guitar that would be worth looking for? You could try to find an F-30 from the first half of the '50s. Probably not easy to find, let alone one that's ready to go. How 'bout one of those Maple Jr Jumbos?? EDIT: Sorry you don't want one smaller than an F-30. This is only an inch bigger than the F-30. Last edited by beecee; 02-08-2019 at 09:36 PM. DANG! That's what I thought but when a quick google search came back with a reported '56 with a 'hog back (here: https://reverb.com/item/5347254-1956-guild-f-30) I thought I was mistaken! Whoa! What? An F60? I just sent them some questions. Can’t find any specs on it. A little pricey for me but I might have to call them tomorrow.